In 1219 St. Francis and Brother Illuminato accompanied the armies of western Europe to Damietta, Egypt, during the Fifth Crusade. His desire was to speak peacefully with Muslim people about Christianity, even if it mean dying as a martyr. He tried to stop the Crusaders from attacking the Muslims at the Battle of Damietta, but failed. After the defeat of the western armies, he crossed the battle line with Brother Illuminato, was arrested and beaten by Arab soldiers, and eventually was taken to the sultan, Malek al-Kamil. Al-Kamil was known as a kind, generous, fair ruler. He was nephew to the great Salah al-Din. At Damietta alone he offered peace to the Crusaders five times, and, according to western accounts, treated defeated Crusaders humanely. His goal was to establish a peaceful coexistence with Christians. After an initial attempt by Francis and the sultan to convert the other, both quickly realized that the other already knew and loved God. Francis and Illuminato remained with al-Kamil and his Sufi teacher Fakhr ad-din al-Farisi for as many as twenty days, discussing prayer and the mystical life. When Francis left, al-Kamil gave him an ivory trumpet, which is still preserved in the crypt of the Basilica of San Francesco in Assisi. This encounter, which occurred between September 1 and 26, is a paradigm for interfaith dialog in our time. Despite differences in religion, people of prayer can find common ground in their experiences of God. Dialog demands that we truly listen to the other; but, before we can listen, we must see the other as a precious human being, loved by God. There is no other path to peace in this bloody 21st century. 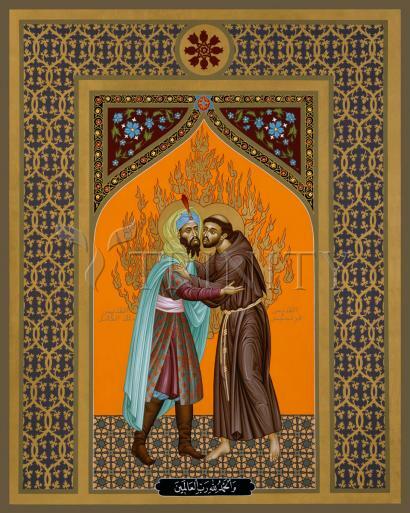 The flames behind Francis and the sultan have a dual symbolism. In Islamic art, holy persons are shown with balls of flame behind their heads. The second purpose of these flames is to disarm a later medieval legend in which Francis challenged the Sufis to step into a raging fire to prove whose faith was correct. In this icon, the flames represent love. The text at the bottom is from the beginning of the Koran: "Praise to God, Lord of the worlds!" Francis and his brothers went to be present among this people who were being portrayed as evil enemies of Christ, and, in his evangelism of presence, Francis found the spirit of God to be alive and at work within the Muslim people, then called “the Saracens”. Francis admired their public, repeated acknowledgment of God and call to prayer, and he appreciated the deep reverence they showed to their holy book, the Qur’an. Francis worked to prevent the brotherhood from becoming embroiled in the grasp for civil and ecclesiastical offices and power, and kept the community’s focus on serving their neighbors for the glory of God only.